The first Hull Trains Class 802 bodyshell has been completed in Kasado, in Japan. The open access operator has five five-car bi-modes on order from Hitachi. The bodyshells will be manufactured in Japan before being shipped to Pistoia (Italy), where the trains will be assembled. They are due to be introduced from December 2019, replacing four five-car Class 180 diesel multiple units. Angel Trains owns the new fleet. The ‘802s’ will operate on electric power on the East Coast Main Line, before switching to diesel away from the wires. They have a top speed of 125mph on diesel and 140mph on electric, although the maximum speed on the ECML remains 125mph. The ‘802s’ also feature 20% more capacity than the ‘180s’. “Now that the body of our first Class 802 is complete, we can show passengers a first glimpse of what our new services will look like,” said HT Managing Director Louise Cheeseman. Looks much like the Class 395 Javelins that were built in Japan and entered service in 2009 on Southeastern’s Domestic Highspeed services that operates to & from London St Pancras International since Eurostar moved from London Waterloo to St. Pancras in 2007. And will replace the Class 180 Adelante DEMU’s that will be cascaded to Grand Central once the Class 802s enters service from late next year. Which could be pushed back to July or August 2019. Why aren't they being built at Newton Aycliffe ? Nope. 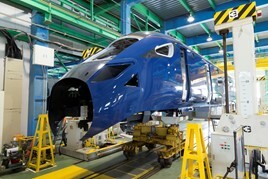 The TPE and Hull Trains Class 802s are being built at Hitachi Pistoia factory in Italy and/or at Hitachi Kasado factory, Japan.